"Dr. Theodore von Karman, often called the "Einstein of aviation," is flanked by models of an old time biplane and a modern jet, at his home in Pasadena, Calif. They span the aviation era to which he has made vital contributions through his research in aerodynamics. His knowledge of winds is credited with making possible the breaking the sound barrier. 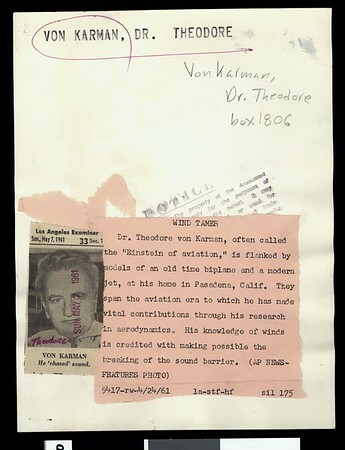 (AP NEWS -- FEATURED PHOTO) | 9417-rw-4/24/61 | la-stf-hf | sil 175" -- typed note attached to verso.